The Jansen linkage is comprised of a eleven-bar mechanism designed by a Dutch artist by the name of Theo Jansen in his renowned collection “Strandbeest.” The system reproduces the movement of a leg and is driven. Its scalable design, energy efficiency, and foot show promise of applicability in robotics. Theo Jansen himself has shown the usefulness of this mechanism during his”standbeest” sculptures which use duplicates of their linkage whose cranks have been flipped by end sails to create a walking movement. since it’s an all terrain vehicle it may be utilized for Planetry Exploration such as Mars since it’s highest payload to weight ratio compared to some other bot. Additionally it’s maximum efficacy for transferring as it’s motivated from nature ( MOVES LIKE HORSE ), it consumes less electricity. It’s also very much shock and light absorbing if it’s composed of lighter and proper stuff like carbon fiber etc. 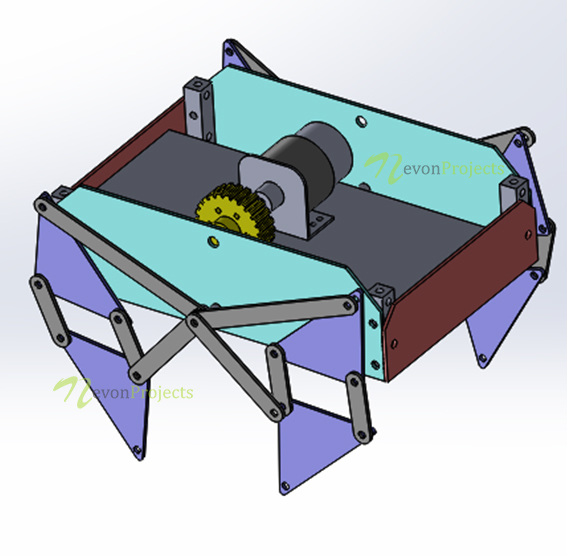 We use this mechanism to drive four legged mini robot and actualize this mechanism using the robotic medium.